The other day I posted a photo of the Dallas skyline and pointed out that the land occupied by Memorial Auditorium/Dallas Convention Center was once the site of a cemetery (or, rather, several cemeteries: the old City Cemetery, the Masonic and Odd Fellows Cemeteries, and the Jewish Cemetery. 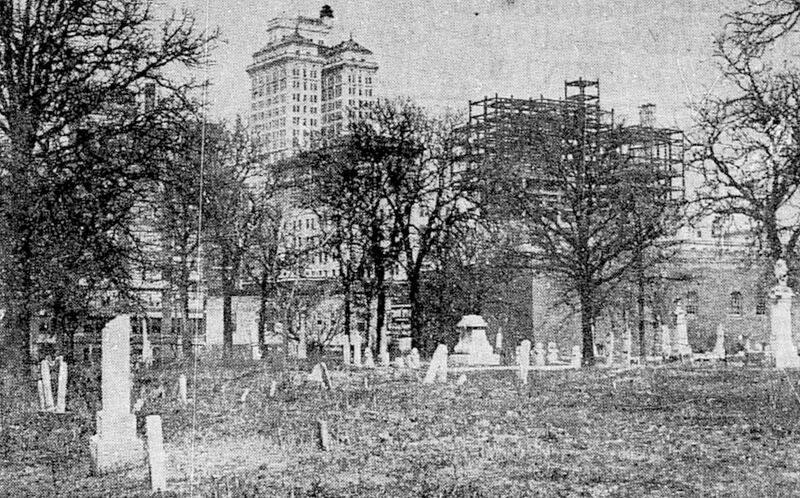 By the 1920s, the grounds were overgrown and grave markers were in various states of disrepair; there were about 500 graves, but many of the remains of those buried there had been moved (resulting in more than a few somewhat alarming gaping holes!). As the 1920s were winding down, fewer and fewer burials were taking place in these cemeteries, but people were still being interred throughout the 1920s — some of these appear to have been indigents without funds to be buried elsewhere. The oldest grave markers dated to the 1850s. 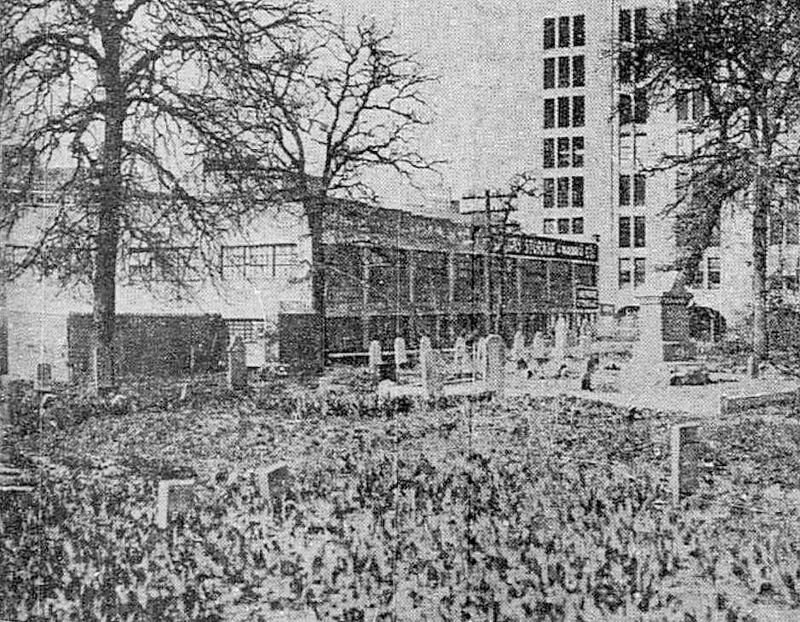 Many of those buried there were important Dallasites: mayors, politicians, pioneer businessmen, doctors, and judges — many of the markers bore names which are now part of everyday life in Dallas (names such as Harwood, Ervay, Akard, Crowdus, Browder, Marsalis, etc.). Over the years, cemetery land had been encroached upon bit by bit (by the Santa Fe railroad, for one) causing many graves to be unceremoniously destroyed. 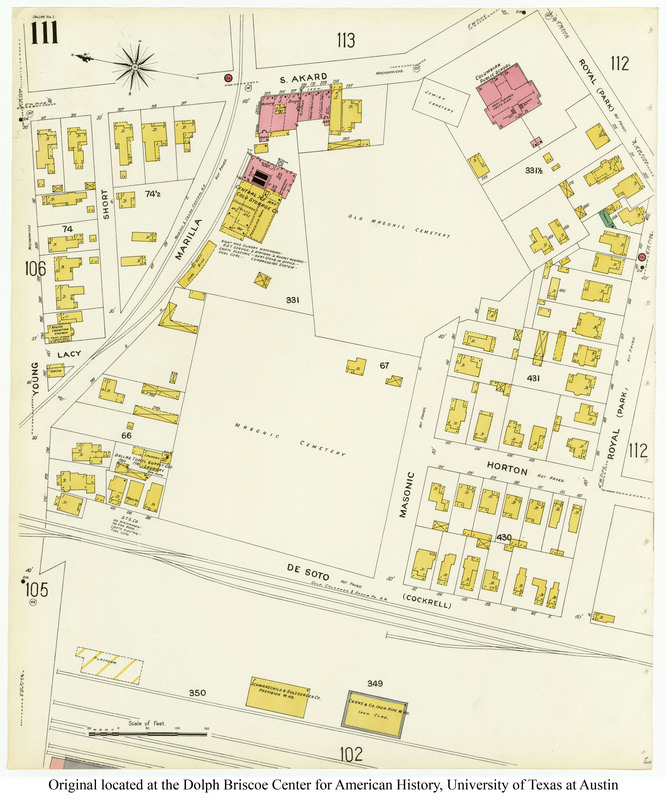 As the city grew and this land (which was once beyond the city limits) became more and more valuable for developers, many of the graves were moved and the remains relocated to other cemeteries. But many remained, and there was concern that the land was being neglected. For decades, the city of Dallas was petitioned by civic leaders to officially protect, beautify, and maintain this land. 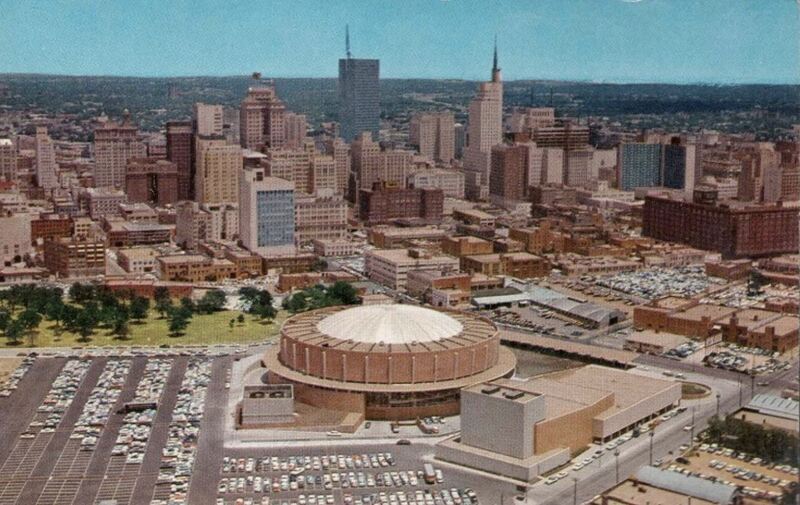 It wasn’t really until the construction of the convention center in the 1950s that these plans began to take shape. Remaining graves and markers are now part of the Pioneer Park Cemetery at Pioneer Plaza. 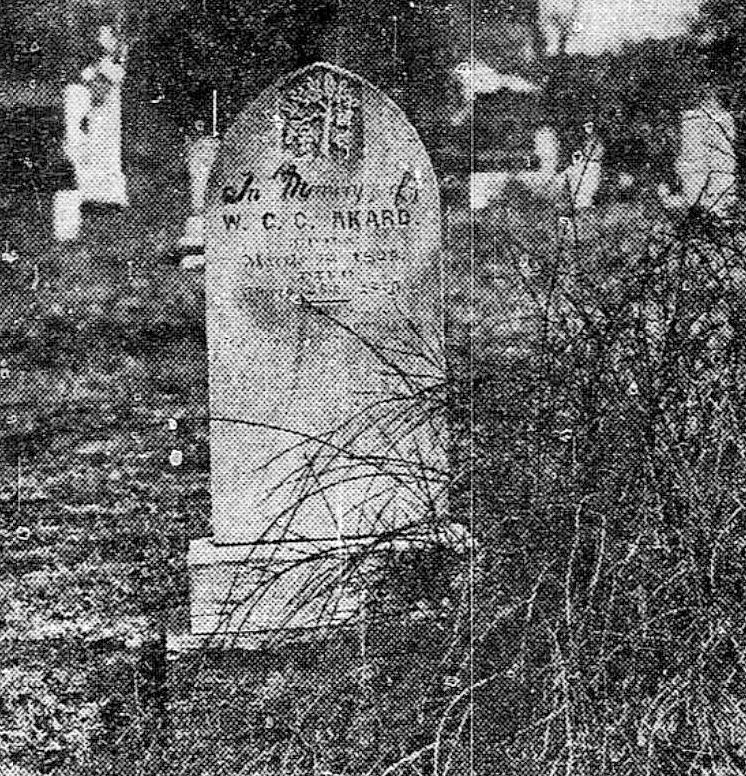 The photo at the top of this post shows the grave of W. C. C. Akard (1826-1870). (Incidentally, according to a 1939 Dallas Morning News article, he apparently pronounced his name “Ay-kard” rather than “ACK-erd” as we do today.) The photos below show the run-down Masonic-Odd Fellows cemetery in the 1920s. 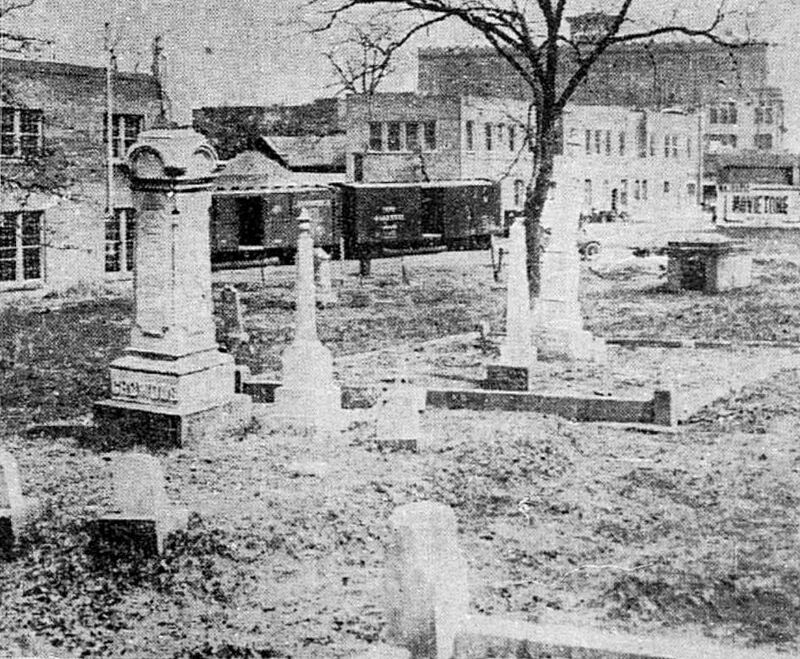 The Masonic and Odd Fellows Cemetery, with the Magnolia Building in the background. Cheek-by-jowl with a growing urban Dallas. 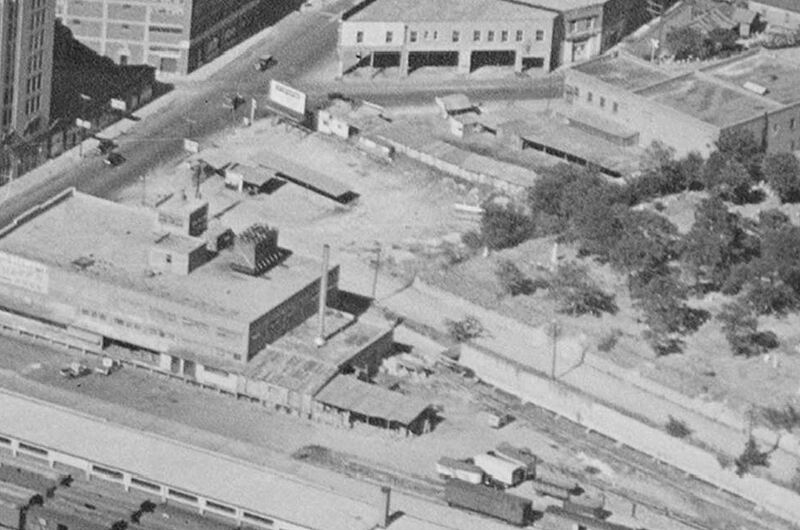 I love this photo, with train cars on the Marilla Street tracks and the Butler Brothers building in the distance, just east of where City Hall now stands. 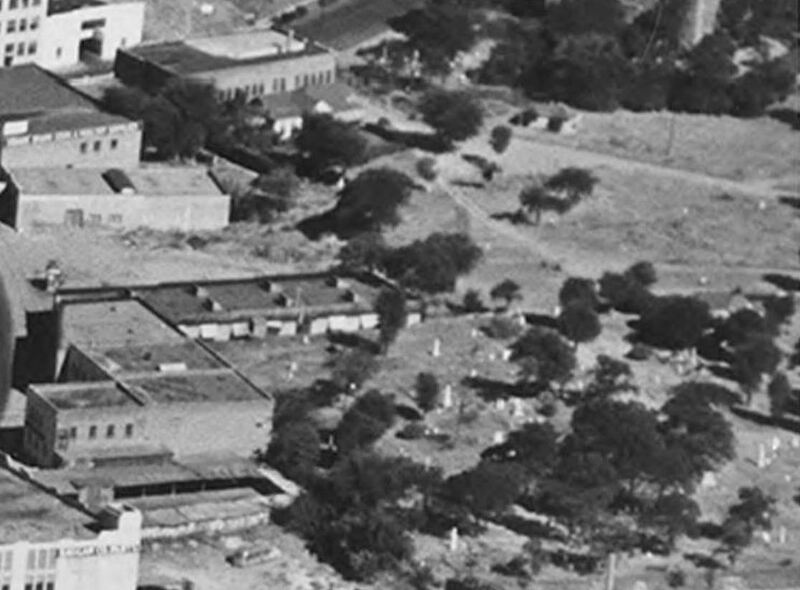 Below are a few extreme close-ups from aerial photographs by Lloyd M. Long (from the Edwin J. Foscue Map Library, Southern Methodist University — links to the original full photos can be found beneath each image). 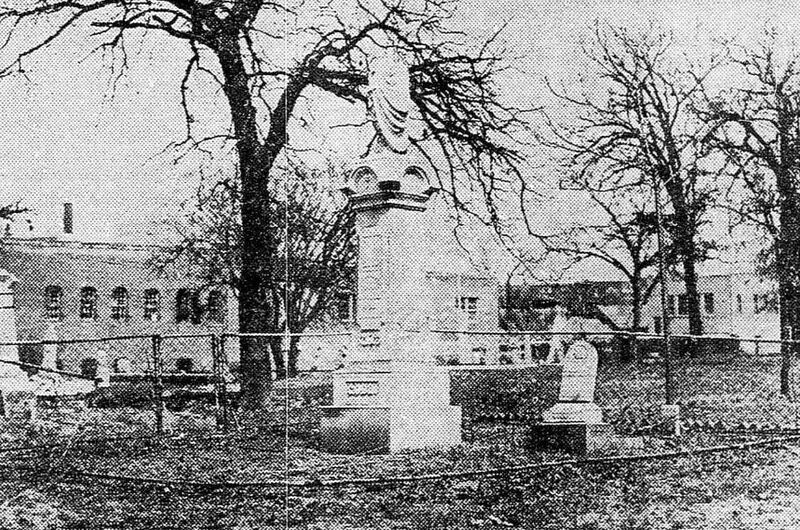 Cemetery markers are visible in these photos taken from the west. Above, a detail from a 1938 photo. Detail from a 1939 photo. And a detail from a 1949 photo. And the “after” photo, with much of the old cemetery land used as the site of Memorial Auditorium. More on this cemetery can be found on Julia D. Quinteros de Hernandez’s timeline, here. 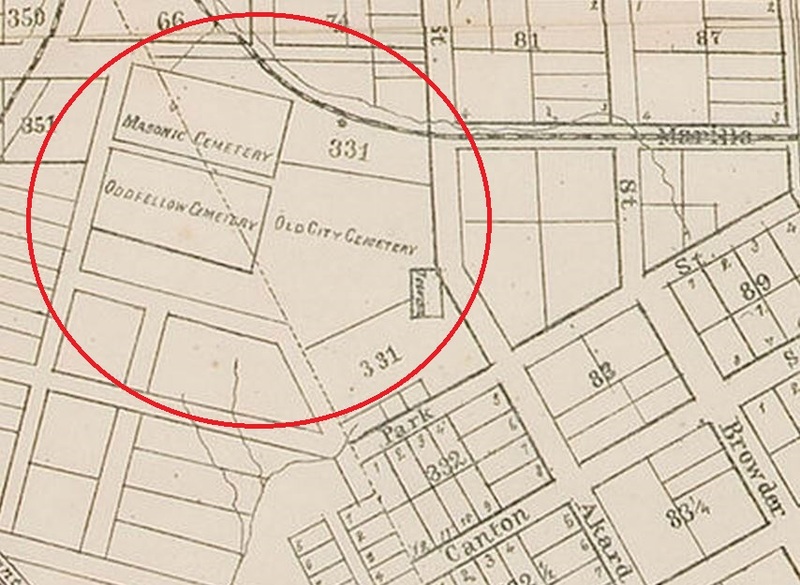 A collection of newspaper stories about the adjacent “Old City Cemetery” (some of which describe shocking disturbances of the land and of graves) can be found on Jim Wheat’s site, here. 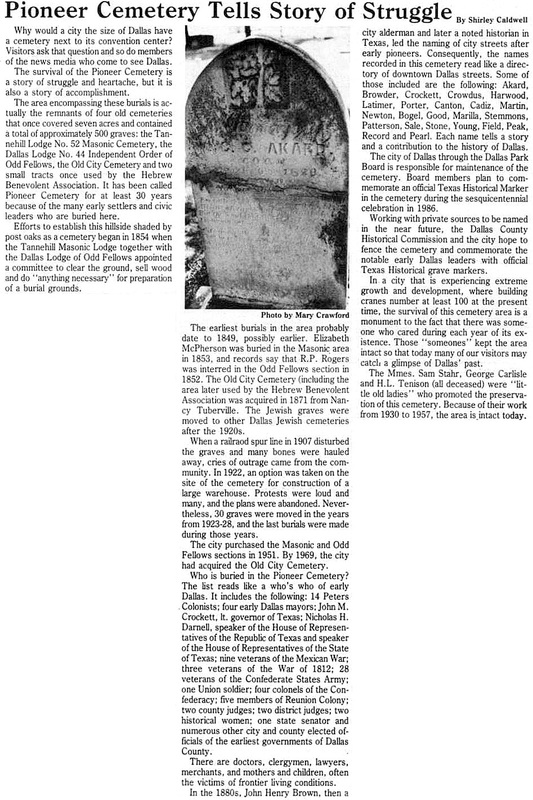 More on Dallas’ older cemeteries can be found in Frances James’ article “Cemeteries in Dallas County: Known and Unknown” (Legacies, Fall, 1996), here. Information about how the city dealt with the plight of the cemeteries amidst the looming possibility of development can be found in the Dallas Morning News article “Park Board Protests Motel at Auditorium” by Francis Raffetto (DMN Dec. 18, 1958). A bird’s-eye view of Pioneer Plaza can be seen on Bing, here (zoom in to see the historic markers in the lower right corner). Great post. 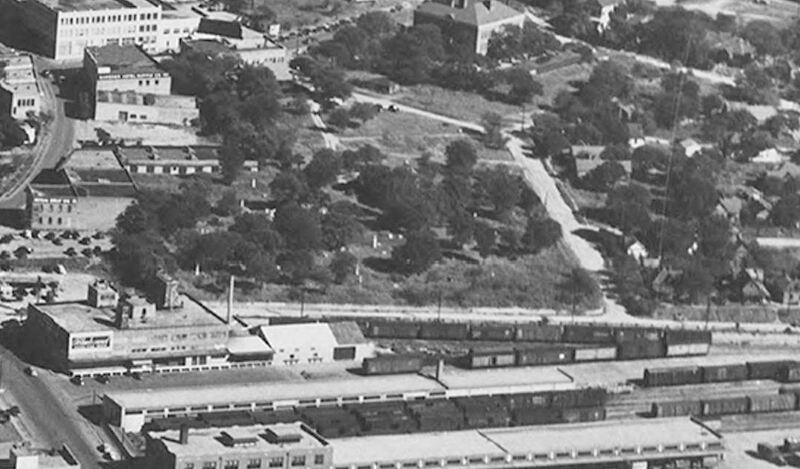 In the 1949 picture you see the Royal Street School at the top (Administration Building at that time) and at the lower part the warehouse that was the Blue Bonnet Brewery with the boxcars entering the tunnel to the Santa Fe Buildings.